1 Mordechai Omer, “The Israeli Artist as a Pilgrim Without a God” in Israeli Artists at the Twelfth Biennial, Paris, 1982 (exh. cat. ), 38. 2 Ibid., 38. The artists that Mordechai Omer chose as representing this thesis were Joshua Borkofsky, Ami Levi, Yudith Levin, Ilana Tencer, Idit Levavi, Roni Ben Zvi, and myself. 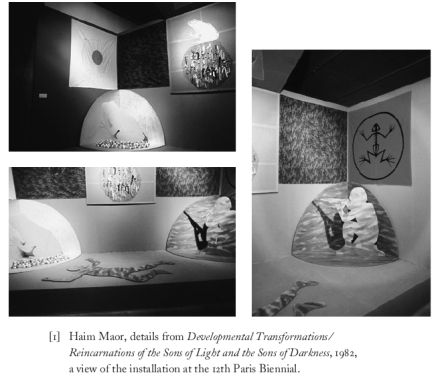 The installation I presented in this framework, Developmental Transformations/Reincarnations of the Sons of Light and the Sons of Darkness, was doubly meaningful for me: it was the first showing of my works outside Israel, and it also marked a turning-point in my artistic career. That is, it contained ideas and content that reflected a shift that had taken place in the focus of my work, from the public/general/political to the private/biographical/familial. In addition, images and formal/coloral/stylistic components that featured prominently in this installation would become transformed and take on new meanings in my later works. Traces of these later developments were already covertly imprinted inside the installation, stealthily marked there, and would be revealed and brought to daylight only later. In this essay I intend to point out these components and characteristics, and to examine and analyze them anew from the perspective of the present in order to identify them clearly and to compare them to a number of my later works. Between 1978, two years after I completed my studies at the “Midrasha” art school (then the College for Art Teachers, Herzliya), and the 1982 exhibition at the Paris Biennial, I had already shown works of mine at a number of solo and group exhibitions (e.g., “Mark of Cain”, 1978, and “Blindness”, 1979, both curated by Miriam Tuvia-Bonneh at the Kibbutz Gallery, Tel Aviv). These works already displayed characteristics that I would go on to develop further: my engagement with ways of seeing and with a ‘regimen of seeing’; with actual, physical blindness and with metaphoric spiritual/social/political blindness; with stigmas; with the ideographic sign and the sign of identity that bounds and stains its subject with a mark of Cain; a multi-dimensional dialogue with the history of art and the history of culture, both general and Jewish (using both visual and verbal quotations and allusions); a use of camouflage as an actual means of concealing (some of the) images and/or as a strategy for making social/political statements in an artistic packaging. performance Dissolving Myths that I worked on for more than a year, and that was shown in the “The Common Factor: Kibbutz No. 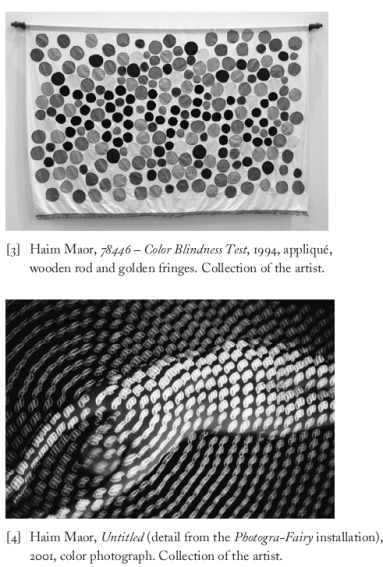 2” exhibition at the Kibbutz Gallery in Tel Aviv in 1980, and in tens of kibbutzim and kibbutz educational institutions during the years 1980-1984. “The Common Factor: Kibbutz” group’s first exhibition was held at the Artists’ House in Tel Aviv and was curated by Miriam Tuvia-Bonneh. The group comprised members of Hashomer Hatzair kibbutzim who had joined together to present exhibitions and conceptual/political artistic actions as responses to “the dissatisfaction they felt with the harsh manifestations of the ideological crisis in the kibbutz – the social and ideational fissures in it that were constantly growing deeper”.3My artistic work during those years focused on the Zionist/kibbutzic/socialist myths and the social, cultural and spiritual processes that had led to their collapse/dissolution – matters that also concerned me as a member of Kibbutz Giv’at-Haim-Meuchad who felt that the reality he lived in was not congruent with the banners still being waved around him. These banners, symbols and slogans had been exposed as “empty signs”. I now saw the kibbutz reality as an “empty package”, like a cart that was rolling down a slope with its precious cargo scattering in all directions, while the carter clutched the reins tightly, as was his habit, unaware that he had no produce to deliver when he reached his destination. I tried to express this feeling in the installation/performance Dissolving Myths and in other works. My interest in “empty signs” and in “full signs” that are charged with meaning was also connected to my ongoing interest in this subject in art history and in visual culture (Kasimir Malevich’s Black Square as opposed to Carl Andre’s minimalist sculptures; the decipherment of pictorial, visual languages – from the ancient Egyptian hieroglyphics, through the medieval emblems and heraldry, to modern fascistic symbols, silhouettes and ideograms in paper-cuts and on ark-curtains in synagogues, pictograms and modern public signboards – the semiotics of the picture). 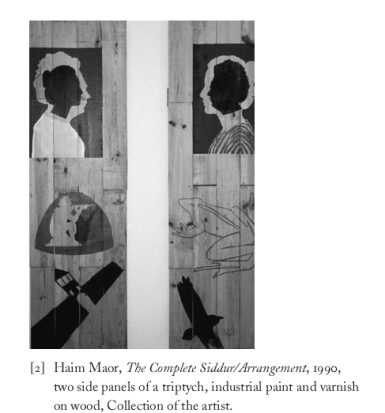 3 Yaniv Shapira, “What’s the Common Factor?”, in The Common Factor: Kibbutz, exh. cat., ed. Yaniv Shapira (Tel Aviv: Kibbutz Gallery, 2009), no page numbers. mythological/mystical characteristics. The point of departure was a found object: a crystal ball with a figurine inside it: a frog squatting on glittering colored stones. This crystal ball had been found by my late father, David Moshkovitz, in a forest in the Carpathian Mountains during the Holocaust. He had adopted it as an amulet, and had kept it with him for the rest of his life. The sketches I showed Mordechai Omer contained stylized images of frogs and their various transformations, as metaphors for social/spiritual human processes in which good and evil, light and darkness, could disguise their identities, change places and roles, and transform themselves into one another. Mordechai Omer identified the connection between my proposal and the theme that he had proposed for the Paris biennial. The original circumstances in which I had conceived the installation were joined by harsh political contexts that developed at the time and were not in my control: a short while before the show in Paris, the massacre in the Sabra and Shatila refugee camps took place. The artists representing Israel in Paris felt ostracized, and also had difficulties in receiving technical assistance in the course of installing the works. Moreover, for reasons unknown to me to this day, the display area that had originally been allotted for my installation was reduced, and I had to improvise a different, smaller installation there. The reception of my installation (both by the visiting public in Paris and by the professional critics, including those from Israel) was cynical. Some viewed the installation as a response of “the sane Left in Israel” to the Lebanon War in general and to the massacre at Sabra and Shatila in particular.6 Needless to say, the installation had been planned and executed many months before the massacre, and related to different contexts. (a mother frog squatting on her eggs – a frog’s egg/a human embryo (an appliqué); a gleaming green frog inside an egg made of camouflage cloth (an appliqué); a mature frog, silver-colored, on a pile of materials (an appliqué); a pale-blue spirit frog inside a golden triangle (an appliqué); the “Toad of Evil”, well-camouflaged (an appliqué); a black skeleton of the “Toad of Evil” on a red background (an allusion to the Nazi flag – an appliqué); masculinity – a well-camouflaged soldier, shooting (a three-dimensional plywood cut-out); death – the body of a soldier in camouflage uniform lying on the floor in the area between motherhood/birth and masculinity (a three-dimensional plywood cut-out). In the complete version the plan had also included black line drawings on the floor (a metamorphosis of the soul of the dead soldier into the figure of the Egyptian goddess Heqet and the creation of tadpoles). Another important image for the conception of the installation was a quasi-scientific drawing from 1892 that displayed an evolutionary process in which man is descended from the frog. In this drawing the frog’s head gradually changes into a monkey’s head, and finally into a head of Apollo. 7 This and other information is taken from the file of the exhibition, which is kept in my archive at Metar and contains all the research materials and preliminary sketches for the installation. religious war to the death between two antithetical world views (e.g. Dr. Rivka Schechter’s book Cosmic Enemy: Pure German Spirituality in its Embodiment as Pure Barbarism, 1979). From these sources it can be seen that the installation possessed conceptual/philosophical/theological characteristics in the spirit of the Christian “morality works”, and was not a critical/political work that responds to a concrete topical event. In April 1983, about half a year after the show in Paris, I traveled to Poland as a member of a delegation of writers and artists representing Israel at an event to mark the 40th anniversary of the Warsaw Ghetto uprising. During this trip I grasped for the first time that as a son of parents who were Holocaust survivors I belonged to “the second generation” – a concept that was fast becoming current in the Israeli collective consciousness from the eighties on. Following this trip and following connections I maintained with Germans from 1986 on (mainly in the framework of TRT [To Reflect and Trust], a research group established by the late Prof. Dan Bar-On, a social psychologist who organized meetings between children of Holocaust survivors and children of the leaders of the Third Reich), the images in my work began to change. They began to disguise themselves and to become absorbed into new images taken from my store of biographical and familial materials (household objects, documents, photographs, clothes, texts in Yiddish and in German, the ways photographs were arranged and hung in the living room of my parents’ home and under the glass of the table in the dining corner). 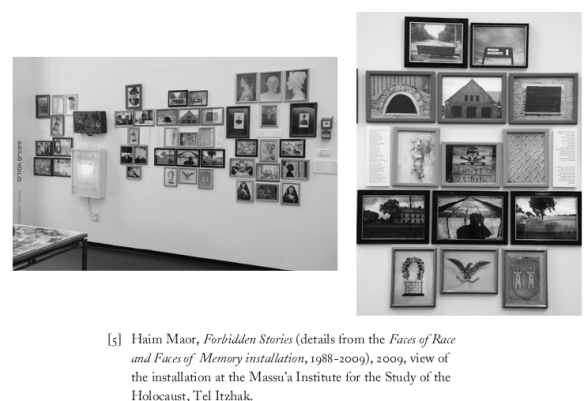 Jews e.g., in the installation Faces of Race and Faces of Memory, 1988). silhouettes of black crows, the structure at the entrance to the Birkenau extermination camp, and silhouettes/black holes of Suzanna’s face inside/on a portrait of myself in profile, or vice versa, (e.g., in The Complete Siddur/Arrangement, a triptych, 1990Fig.2; The Forbidden Library, an installation, 1994). form, out of spiral clusters of colored circles of lightFig.4. I continued using the camouflage cloth I had used to camouflage the toad in the 1982 installation (and other camouflage cloths I purchased in different colors) to create ark curtains (parokhot) with the sentence “I am a Jew” inscribed on them in Yiddish or in English (1994, 2008). Shoshana, and others, I stopped using cut-out silhouettes made of plywood or stitched onto cloths. I began using various photographs I had taken in Poland or Germany. In these photographs one can see, for example, the silhouettes of Goethe or of Suzanna; a figure-like shadow lying on the railway track in Birkenau; a black pictogram of a skull and crossed bones on top of a perimeter fence at the extermination camp; a bluish “Rorschach blot” that brings to mind a thin female figure “floating” on the whitewashed wall in the gas chamber in Majdanek (all these photographs appear in the Forbidden Stories chapter in the Faces of Race and Faces of Memory installation (1998-2009)Fig.5. to construct a whole out of memory fragments. Is this a picture of a world of memory fragments that once constituted a whole? Or is it a world that was created out of memory fragments, on top of memory remnants? in Gaza and lives in Rahat. In our joint project, which is called The Family, Khader paints members of my family in his way, and I paint members of his family in my materials and style. In one of the four series I have created, silhouettes of Khader’s family members are painted on parchment, cut out from parchment and emitting their light from inside the light-boxes that enclose them. In some strange way they too are a new development of the images that were shown in Paris. 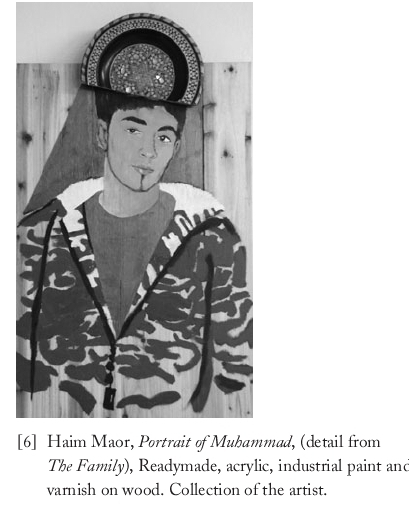 In another series, the complex, ambivalent identities of Khader’s children, who are painted on icon-like wooden panels, are reminiscent of the arches, the triangles, the religious contexts and the decorative motifs in that installation (e.g., in Portrait of Muhammad, 2009Fig.6). Viewed reflexively, however, the iconographic conception of Developmental Transformations/Reincarnations of the Sons of Light and the Sons of Darkness was essentially dichotomous: a contrast, confrontation or struggle between sons of light and sons of darkness, white vs. black. The Family, 2007-2009, presents a more mature stance – complex, reconciled, whole and accepting. The view each “I” has of the “other”, and the reflexive view each of us has of himself recognizes the existence of a gray expanse in which both sides dip their feet and encounter the power of the synergy.